The first assembly activities have been carried out for the largest tool in the ITER arsenal—the giant sector sub-assembly tool (SSAT) that will be strong enough (and tall enough) to suspend a 440-tonne vacuum vessel sector during pre-assembly activities. The ground-level elements of the tool are now in place. The red base plates have been mechanically installed; next, contractors will add grouting and install the first rail components. 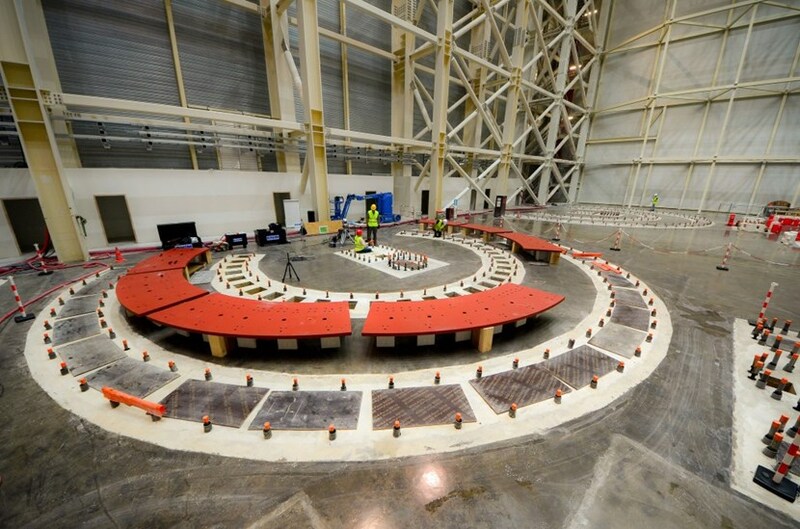 Space is reserved on the right for a second sector sub-assembly tool (SSAT #2), whose elements are under construction now in Korea. In the first in-situ assembly operations, the rail base plates of the SSAT tool were mechanically installed onto waiting fixtures. In the next few days, these plates will be grouted onto the reinforced floor slab and the first rail components installed. The plates provide the fundamental supporting structure for the rails and the moving platform of the tool's lateral wings. Driven by precision hydraulics, the wings will rotate to deliver a D-shaped toroidal field coil and vacuum vessel thermal shield segments for installation on either side of the vacuum vessel sector. The rail base plates before installation. Designed by ITER's Tokamak Assembly Section/Division, the plates were manufactured in France, by CNIM (Toulon). Jens Reich heads the Tokamak Assembly Section/Division that drafted the design of the plates and issued the drawings for manufacturing. His group will also control alignment throughout the installation process. "This successful first operation of SSAT assembly is exciting for my whole team. We have been planning for the ITER installation and assembly phase for years, and now we have realized the first tangible activity." 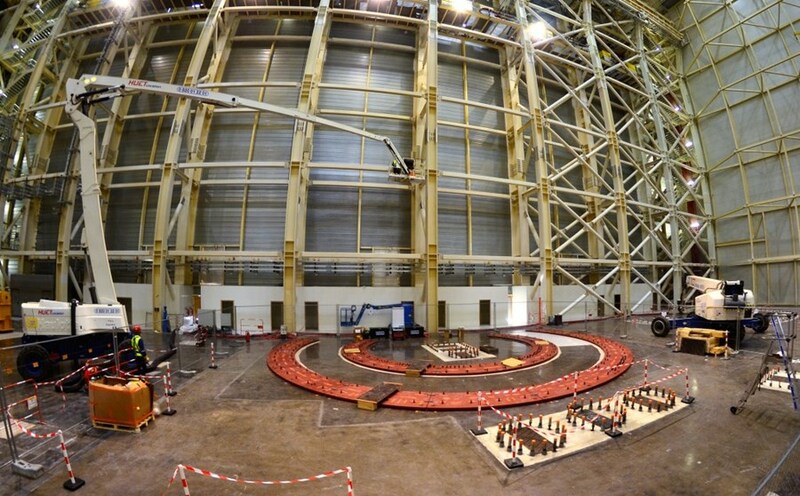 In the Assembly Hall, two of these giant tools will be in action to equip the nine vacuum vessel sectors, one by one, before the completed sub-assemblies are transferred to the Tokamak area for installation. 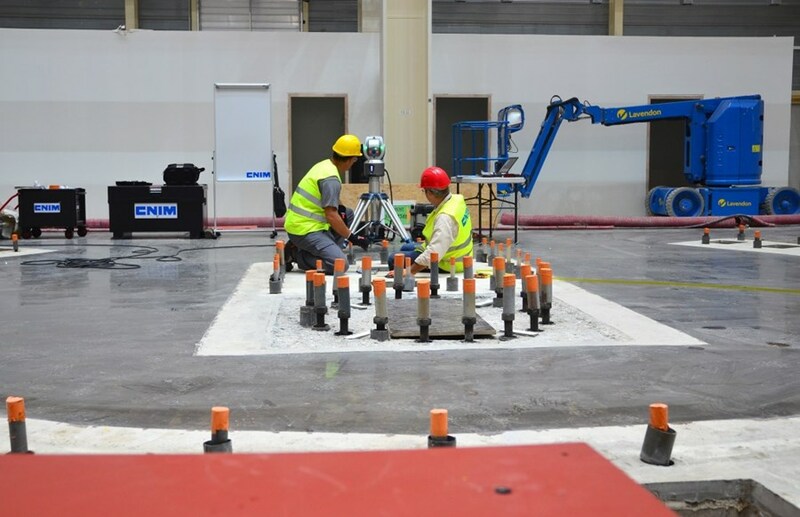 Careful measurements were taken before, during and after the installation of the base plates, which will serve as the ''zero level'' reference point for all tool installation activities ahead. The rail base plates were manufactured by CNIM in Toulon, France—the company selected as the subcontractor to tool manufacturer Taekyung Heavy Industries (Korea) for onsite assembly activities. Throughout the installation and alignment of tool components ahead, the rail base plates will serve as the "zero level" reference point.